Chicken fillet — 4 pcs. Turmeric — 1/2 hr. Liter. Milk — 4 tbsp. l.
Vegetable (or cream), butter — 2 tbsp. l.
1. For the stuffing chop herbs and mix with cottage cheese; add milk, turmeric, sagging through a press garlic, salt and black pepper. 2. In each chicken fillet to make a deep cut to form a pocket. Fillet of stuff the stuffing. 3. smear each fillet with vegetable or melted butter. Roll in bread crumbs. 4. 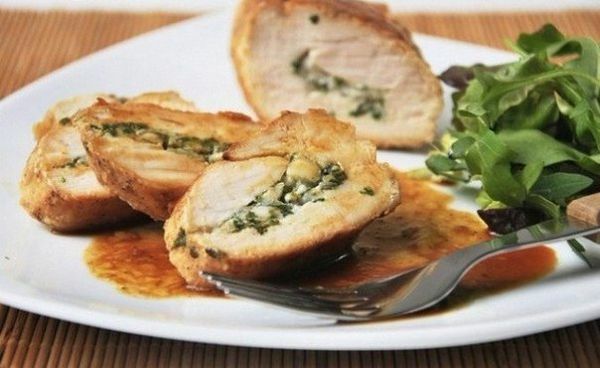 Place the fillets in a refractory form and bake at 200 ° C for 20 minutes, basting occasionally precipitated juice.